A woman dressed in black stands in the foreground of the picture plane. Her left arm is bent at the elbow while her right is extended, index finger pointing towards to ground. Her unflinching gaze is set firmly on the viewer. With one of her eyebrows slightly raised, she has an expression of melancholy on her face. 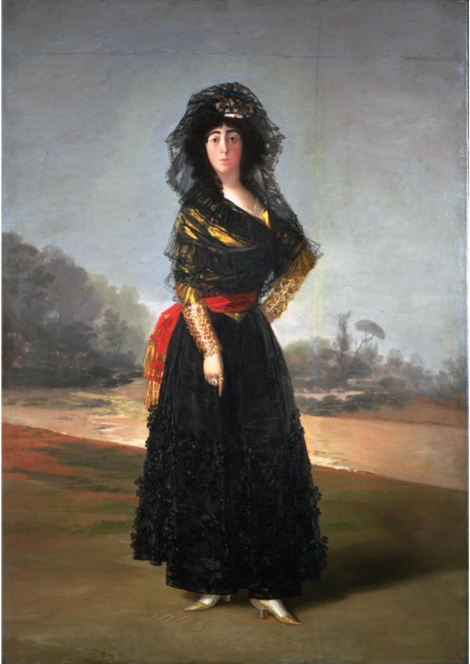 Francisco Goya’s 1797 oil painting, The Duchess of Alba, is a portrait of a woman in mourning. The Duchess’ loneliness is accentuated by her solitary position in an open field. Domenichino’s Saint Cecilia with an Angel Holding a Musical Score.. This painting is displayed at the Musée du Louvre; the image was sourced from the Louvre website. The Italian artist Donatello died in 1466, years before the beginning of the High Renaissance (which Gadsby dates as 1500–1520), and therefore Donatello the Teenage Mutant Ninja Turtle has no place among the other artist namesakes. Despite the evidence that plentiful technical skills were in abundance in the seventeenth century – skills that were used to craft the cello, for example – music stands did not yet exist and women had to rely on fat babies to hold sheet music for them, as evidenced by Domenichino’s 1617–18 painting Saint Cecilia with an Angel Holding a Musical Score. And, importantly, we learn that artists are not gods. As such, they are not worthy of the status we often afford them. It is permittable to critique the work of the so-called Old Masters. Indeed, it is important to do exactly this. Gadsby’s message is that these men – “the men who name everything” – should not hold such a great influence over women’s bodies. Gadsby refers to the example of Flemish Baroque painter Peter Paul Rubens. As much of the audience seemed to be aware, Rubens is known for painting beautiful, naked women in a somewhat more corpulent manner than other artists. This has led to larger women being dubbed “Rubenesque”. While no doubt those using the moniker believe they are saving the woman from embarrassment – ‘you’re not fat, you’re “Rubenesque”’ – Gadsby, who has received this compliment numerous times, questions the usefulness of comparing women’s bodies to paintings. Moreover, she strongly opposes the naming of the female body after a male artist. One can even question the need to comment on women’s bodies at all. If you’re expecting to see another Nanette, you may find yourself disappointed with Douglas, which is distinctly less confronting. However, Gadsby’s intelligent writing and sagacious sense of timing make Douglas no less impactful. Both shows are intensely personal. While Nanette focused on her self-image concerning her homosexuality, Douglas focuses on her issues with poor body image, and her struggles with Autism Spectrum Disorder. In Douglas, Gadsby strips away her remaining armour and leaves herself standing naked in front of the audience. Yet, Gadsby’s nakedness is of her own doing. She is not a passive body displayed for the male viewer. Not shying away from her position, she informs us that making herself vulnerable is a dangerous thing. This is followed by a heart-wrenching account of the last time she allowed someone to see her for all that she is and how that person betrayed her. Gadsby’s most recent comedy shows have seen her challenging the very nature of comedy and nurturing her own comedic style. While in the past, Gadsby has used her stand-up routines as a coping mechanism to hide a painful truth, she now confronts it head on. As Gadsby’s tour promotion succinctly summarises, Nanette helped Gadsby to find her voice after years of being silenced and in Douglas, she plans to use it. Douglas played at the Arts Centre, Melbourne from 27 March to 7 April 2019 as part of Melbourne’s International Comedy Festival. The show will be returning for one night only at Melbourne’s Palais Theatre on 7 December. If you move quickly, you may be able to get tickets.